The Xtreme GTR is quickly becoming one of the most recognisable R32 GTR’s on the planet after taking on World Time Attack Challenge in Australia. This carbon clad monster offers its driver over 1000 BHP at the engine which is transferred through to its wheels through an Albins ST6-l 6 speed sequential gearbox and an XClutch (Xtreme Clutch in Australia) 7.25” quad plate ceramic racing clutch. The Xtreme GTR required a full rebuild between the 2017 and 2018 event after a catastrophic engine bay fire almost completely destroyed the car. Car owner Michele Guyer went to work with her team and a range of quality suppliers to build one of the world’s fastest R32 GTR’s. XClutch has a history supplying racing clutch kits for some of the highest power GTR’s on the planet and quickly went about finding the ideal solution for Michele and her team. After careful consideration, XClutch chose a kit that had previously been used in the incredible R34 GTR of Matt Longhurst. The 7.25” quad plate is ideal for the vehicle with a lightweight construction for improved throttle response and 1770 ft-lb torque capacity. The ceramic friction discs also offer incredible heat capacity which is ideal for the stresses seen in time attack vehicles. 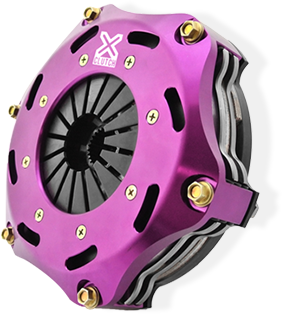 For more information on the XClutch range of motorsport kits, please contact us.